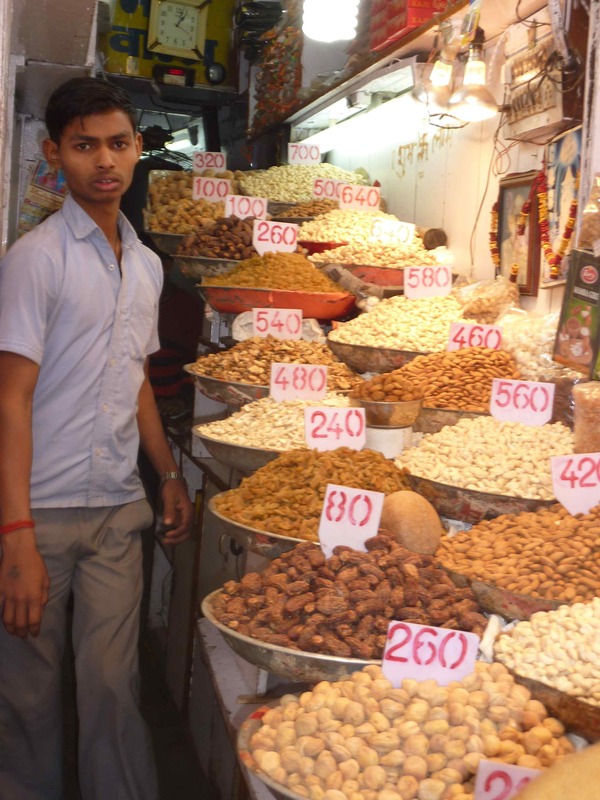 You might think that Ghandi stopped the Caste system in all of India, but there are still some places in the country that haven’t been, as Rikki puts it, “un-classed”. In these places, a lot of people marry within their Caste, and your social ranking still affects life. 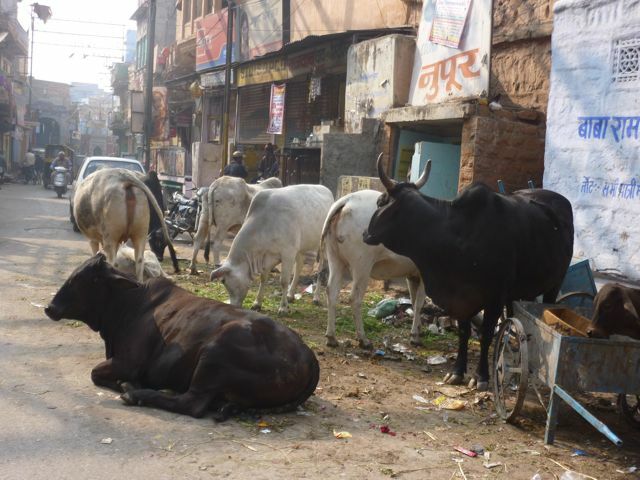 In one of these villages, there was a bull who was chasing a boy. He was about to be killed by it, but no one would help him because he was an untouchable, the lowest Caste. The Untouchables were the toilet cleaners, who came to pick up the night waste. Nobody wanted to touch them because they were all germy and dirty. They weren’t allowed to go to school, shop at stores with other Castes, or even have any other jobs. The Untouchables had no opportunities, their children had no opportunities, and their children’s children don’t have any opportunities. 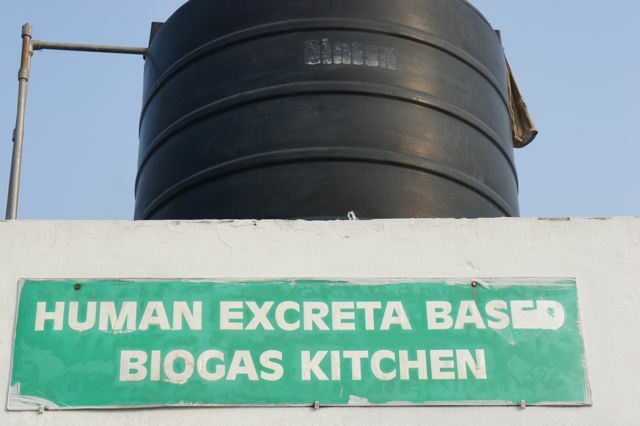 Bindeshwar Pathak, the guy who started the Toilet Museum, noticed this. 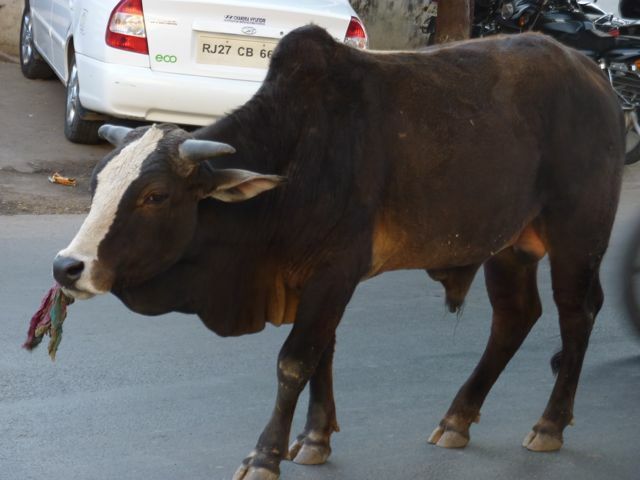 Actually, he witnessed the incident with the bull. It affected him so greatly that he decided to continue Ghandi’s work by changing the fact that Untouchables were, well, untouchable.. His mission was to get rid of the Untouchable’s job, disposing of the waste, so that they would be free to do other things. 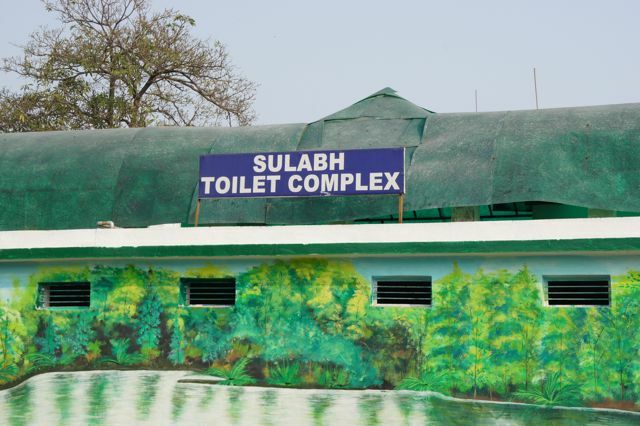 Through his social services agency Sulabh International, he brings sanitary health facilities to both villages and rural areas. He created the two-ditch compost toilet system. He started schools, clinics and helped people find jobs. Now that the Untouchables could be freed from their jobs of waste handlers, hopefully they could be freed from the other injustices of their lives as well. This used to be urine. Still, don't drink it. 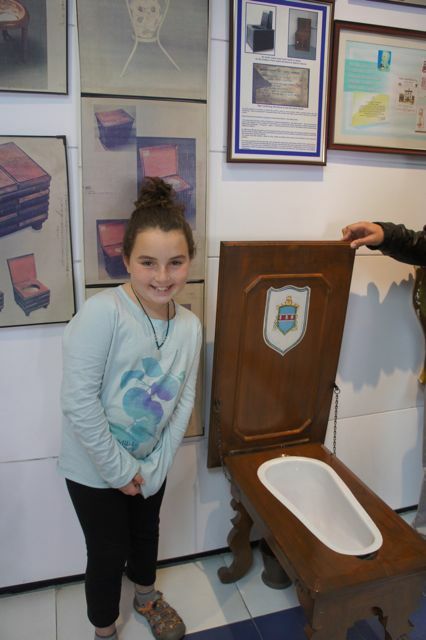 There was also a very informative section in the museum about the history of toilets. 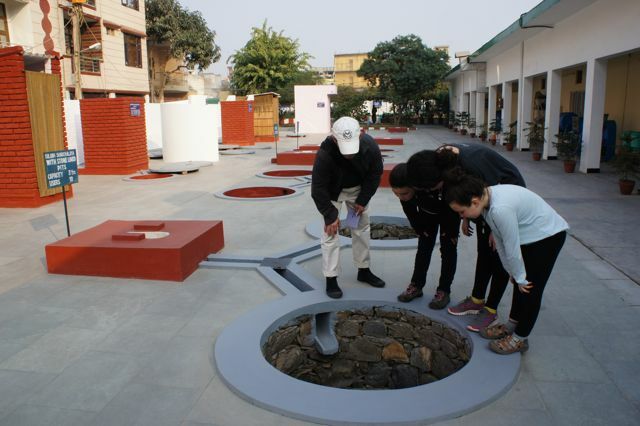 Did you know that the first toilets were found in ancient India? 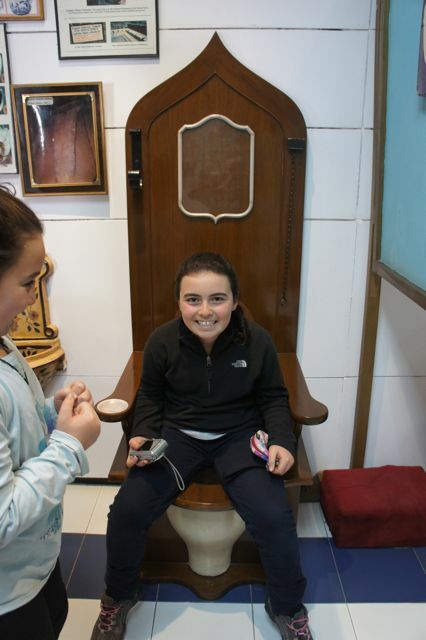 We had so much fun at the toilet museum. 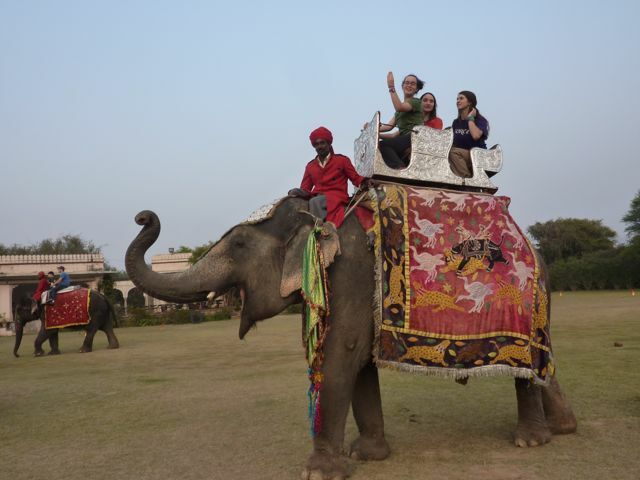 It was the perfect, slightly ironic end to our wonderful time in India. 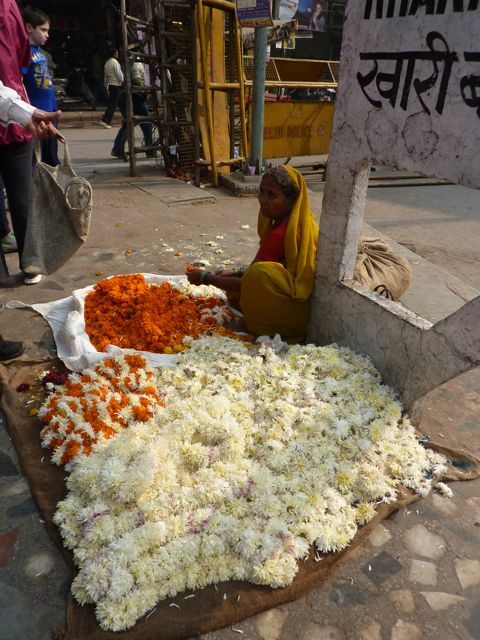 If you’re planning on visiting New Delhi soon, make sure you stop by for a bathroom break! 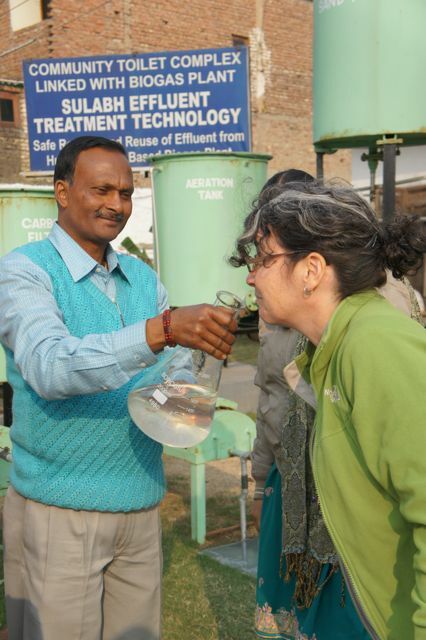 Without any prior knowledge of the other’s writings, Eva and David had both written a blog about life on the roads in India. In the interest of encouraging writing, we thought we should publish both even though they may seem a bit redundant. 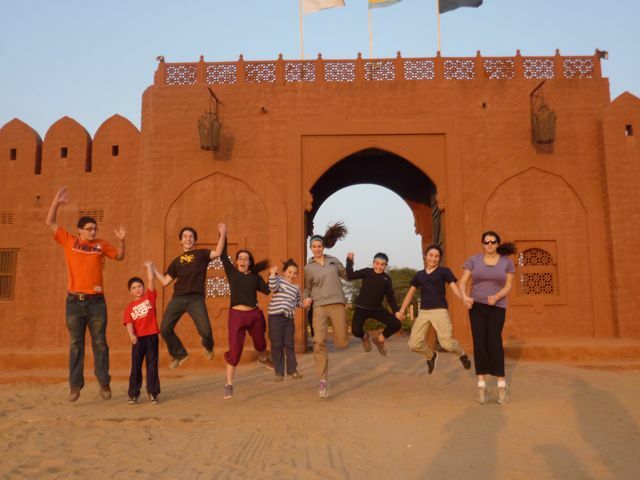 We have been driving around Rhajastan for three weeks. There are a lot of things to see on the side of the road. There are so many animals. We saw cows, goats, bulls, dogs, cats, peacocks, camels, elephants, donkeys, monkeys, horses, crocodiles, sheep, chickens, boars, and very pretty birds! These animals are walking on the street as if they were cars. People are also doing strange things on the side of the road; going to the bathroom, cooking, eating, laundry, shaving, washing dishes, black smithing, cleaning instruments, making kites, and bathing! This cow actually walked up to a parked motorcycle, pulled the scarf off the handlebars and had a meal. We saw the whole thing. If I were ever lucky enough to have my own personal driver (which the State of Michigan Department of Transportation would highly encourage), I’d want him to be from India. Specifically, I’d want him to be from the state of Rajasthan where I personally experienced the unshakable nerve of two different drivers over our three weeks in India. These two men drove for days on end without stopping to eat, relieve themselves, or sleep. I’ve been known to do all three of those things on a 15 mile trip. But more than their endurance behind the wheel, was their ability to maneuver the impossible obstacle course that is the Rajasthani road. Imagine driving a large van at 70mph on a two-lane highway. There is a heard of 10 cows meandering across the road 50 yards ahead, a three wheeled auto rickshaw is passing you on the left (there isn’t a shoulder exactly but a few inches of room between the edge of the road and the guard rail), and there is an incredibly large Masey-Ferguson tractor pulling a wagon filled with hay that is so overloaded it may tip at any moment, coming at you in your lane as it tries to pass a slow moving motor scooter driven by an elderly man wearing a colorful turban, sporting a thick-black handlebar mustache (the sign of a Rajput or warrior from Rajasthan) with a sari-clad woman sitting behind him, side saddle of course, and holding two small children in her arms. Everyone is blasting their horns, brights are being flashed constantly but nobody looks angry or frightened, except the gringo passengers in the van. 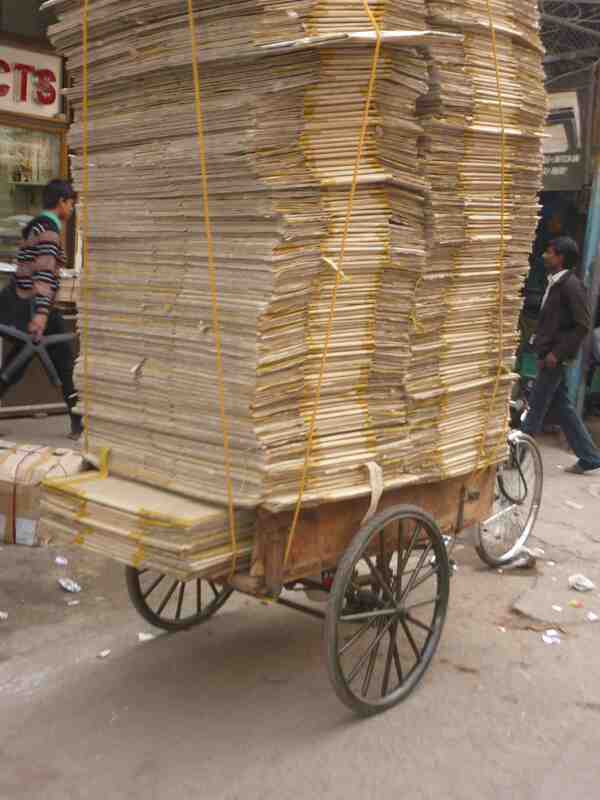 Imagine this scene 70 or 80 times a day and you’ll begin to understand the challenges of driving in India. For a country with the second largest population in the world (1.2 billion on a land mass the size of the UK) and the largest democracy, it’s surprising that the roads are so pure. Unlike the Chinese, the Indians do not seem to be pouring their money into infrastructure projects in Rajasthan. 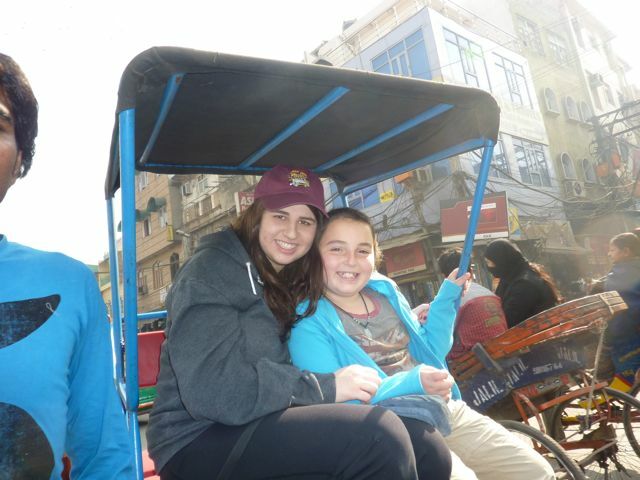 Although being on the roads in India was a risk, it was an amazing way to see life unfold. 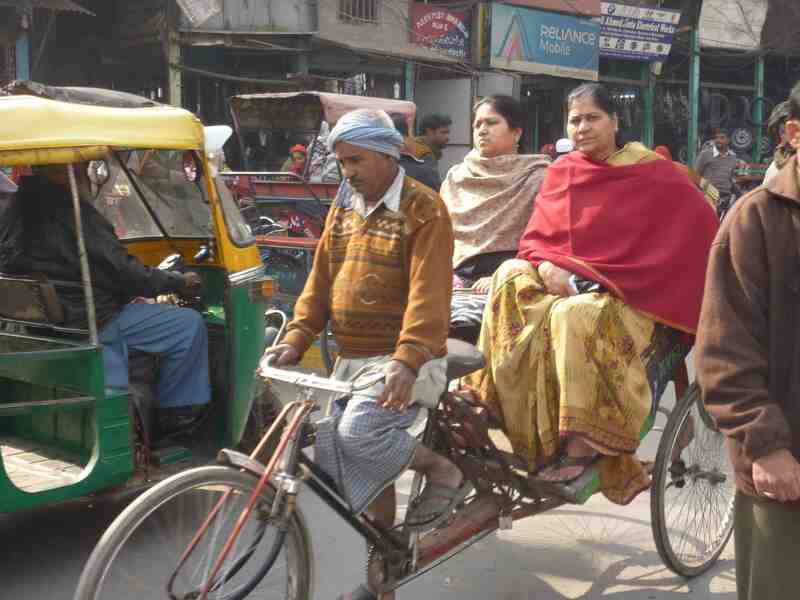 As an Indian woman we befriended told us, “Life in India happens on the road, right out in front of you.” It’s so true. We saw it all, including; hair-cuts, funerals, auto-repair, bicycle repair, scooter repair, farming, people bathing, kids going to school, kids skipping school to hop on our bus and do magic tricks for money, adults going to work, adults wanting to come on our bus to ask for money, women collecting cow dung and making cow patties, women carrying various-unimaginable and incredibly heavy objects on their heads, women gatering fire wood, women making handicrafts, blacksmiths hammering crude steel tools over hot coals, camels and water buffalo driven by turbaned men pulling incredibly large loads of everything under the sun, women washing clothes, grown men and children defacating, urinating, coughing up a lung, herding animals including chickens, cows, water buffalo, pigs, and others all before our eyes. 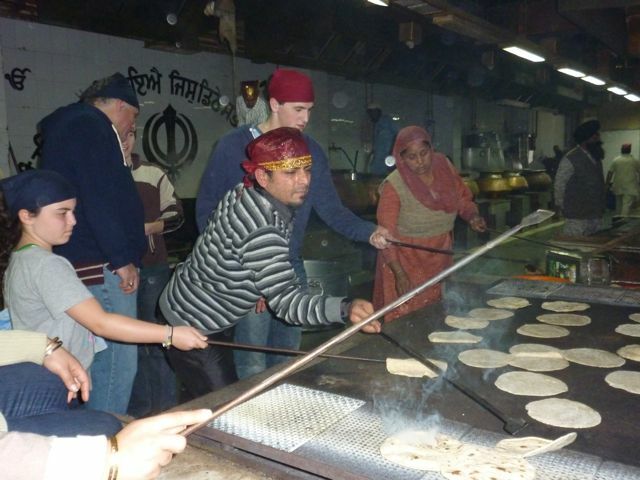 The country is incredibly complex with the mix of Hindus, Muslims, Jains, Sikhs, a couple of three Jews, a Zorastrian or two and a few random others. Adding to the complexity is the caste system that doesn’t officially exist but is ever present. Interestingly, the Brahmans or priestly class are suffering from affirmative action type policies that have been implemented to help raise the living standards of the lower caste people. Rather than go on about what we learned, I will give you some highlights using photos. 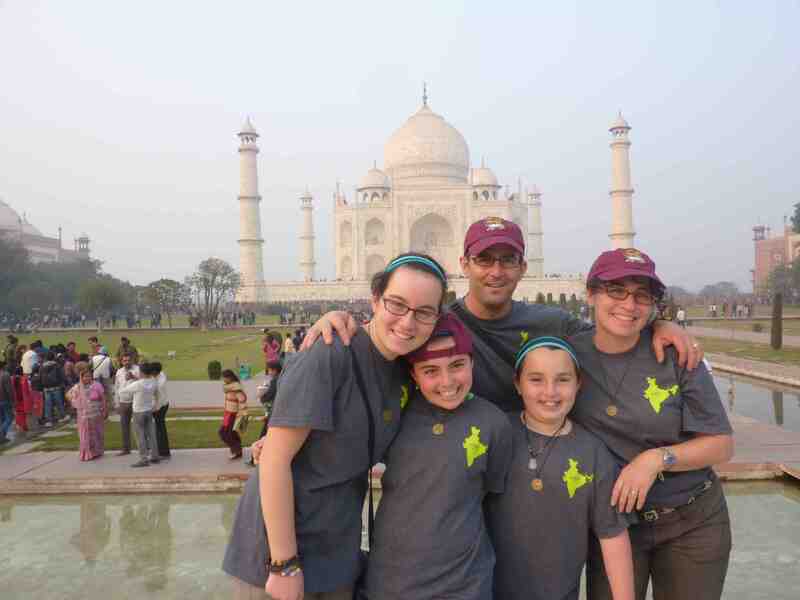 The first week of India, we were joined by the Katz family (Greg, Laurie, Benji, Jackie, and Joey) and the Hersch family (Ed, Julie, Emily, Michael, and Rachel). Greg planned everything and it was awesome, non-stop action. The rest of the trip was just the Goldmans. What follows are some (but not all) the highlights via photos. (Click on the photo to make it larger). Imagine the Lower East Side of New York or Chicago's Maxwell Street in 1901 and you'll have a pretty good picture of what the Old Delhi Spice market looks like. Taj Mahal was built by Mogul Emperor Shah Jahan. His son sent him to prison after Shah Jahan spent a fortune building the palace in honor of his favorite wife. The local villagers were very excited to greet us when we landed and wanted us to take a picture with them. 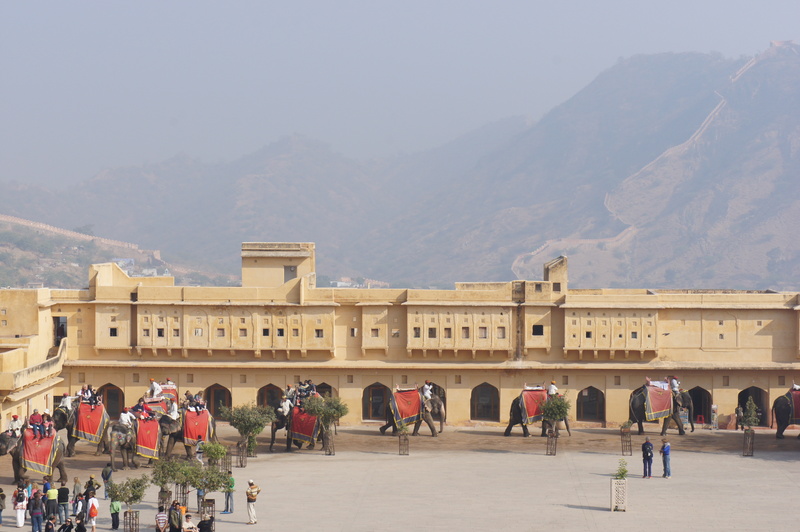 The palace dates back to the 16th century. 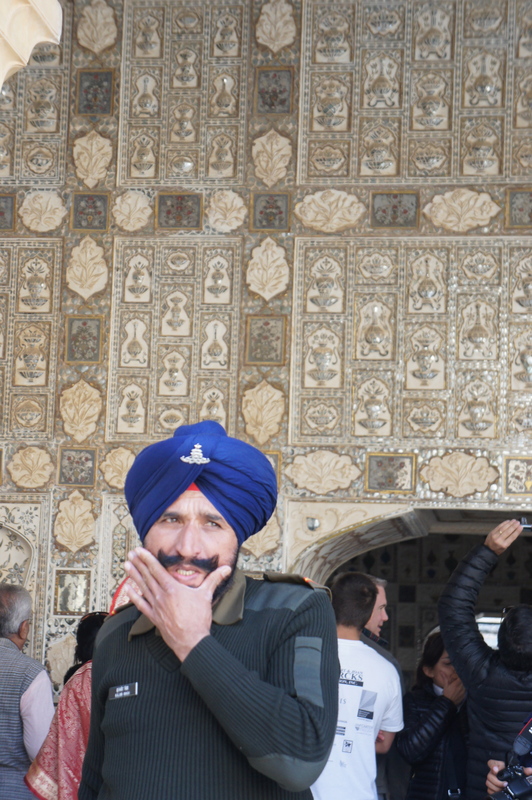 This is a Rajput man, easily identified by his mustache and turban. 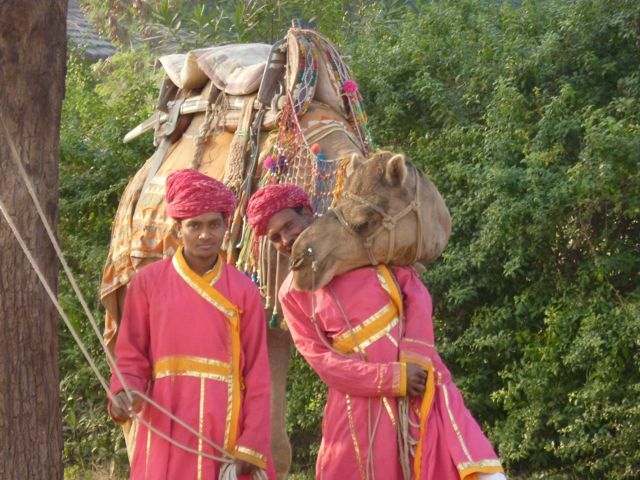 Rajput's are the warrior class and were the rulers and builders of all the great palaces. This man is guarding the mirror palace within the walls of the Amer Palace. The Amer Palace had indoor toilets. Their utility is demonstrated by Joey Katz. 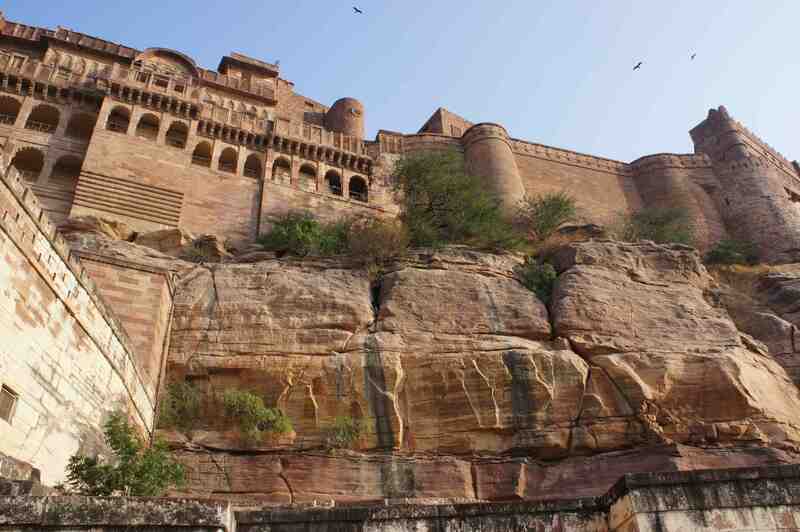 Next we went to Jodhpur and saw the 15th century Mehrengarth Fort which was built into the mountainside in 1459 by Rao Jodha, the 15th ruler of the region. 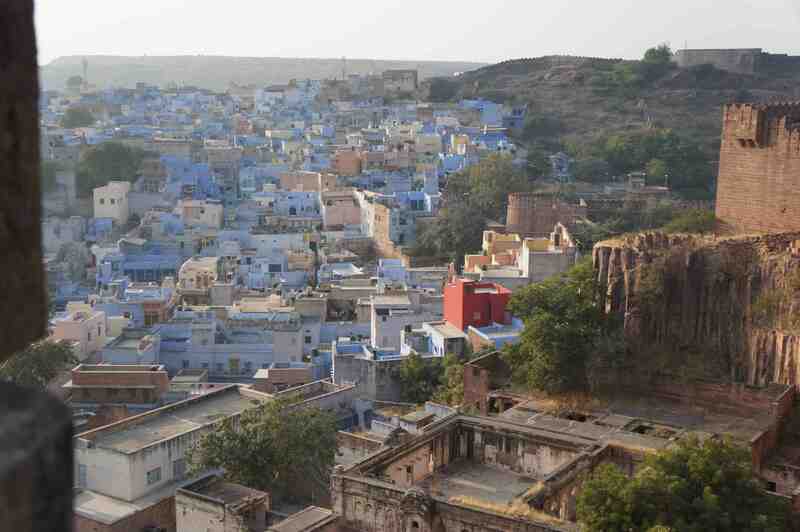 The fort looks out over the Blue CIty of Jodhpur. All of the Brahman's homes are painted blue. 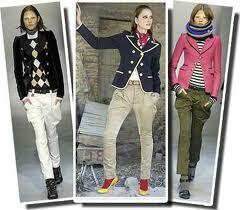 Johdpur may be better know for the pants they have made famous. Greg arranged for all of us to go zip-lining over the Fort, here is Laurie Katz zipping down! 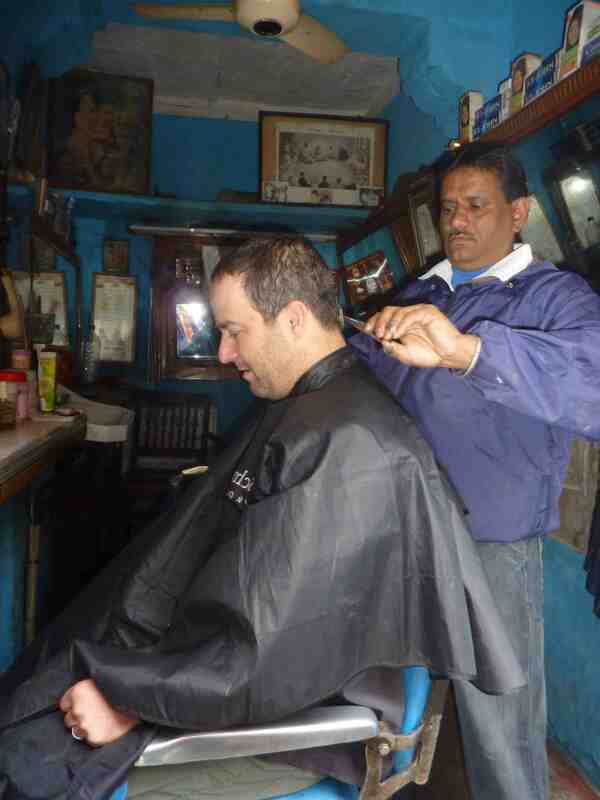 We also had a chance to walk around the Blue City where I got a hair cut. When asked to pay, the barber said, "as you wish." I paid the equivalent of $2 which thrilled him. The actual price, I was later told, should be about 17 rupies or less than $.50. I even got a shave with a straight blade. 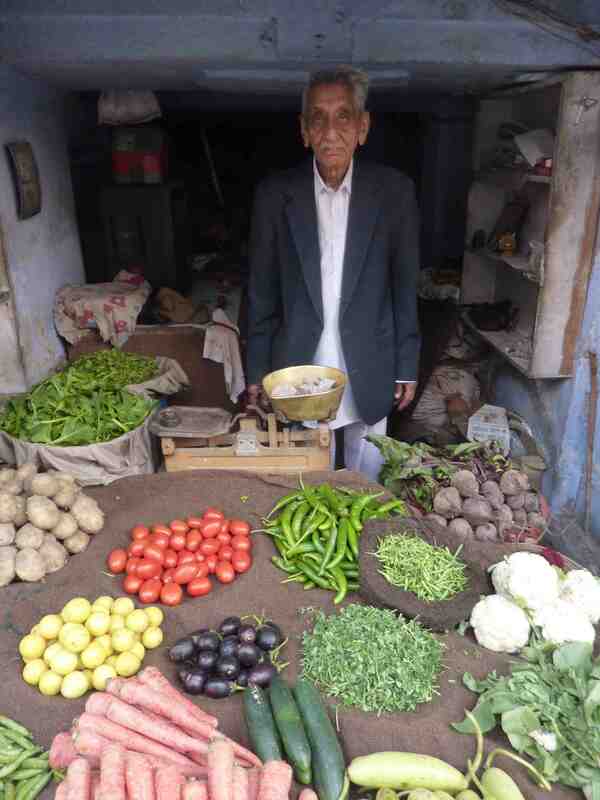 This 92 year old man has been selling veggies in the Blue City his entire life. He removed his hat and smoothed his hair for this picture. 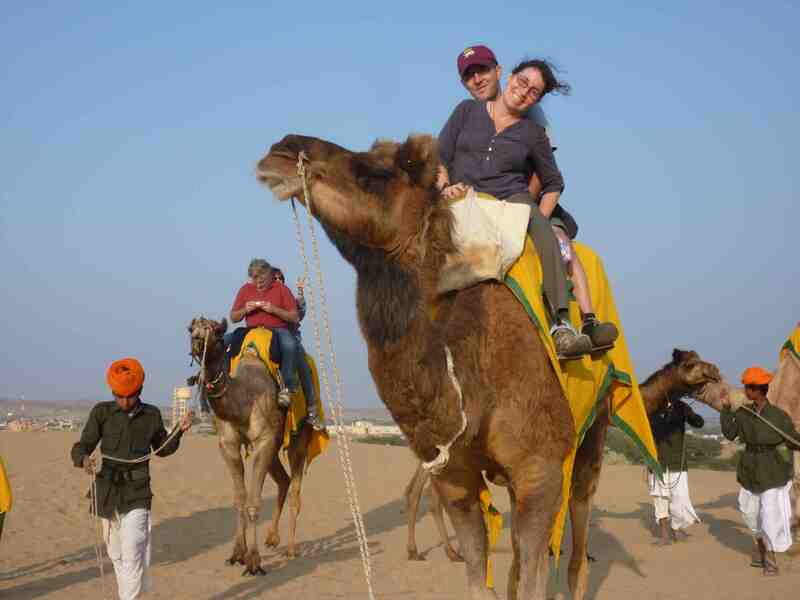 Next we were off to the Thar Dessert where we stayed in tents at a camel camp and went for a great camel ride. 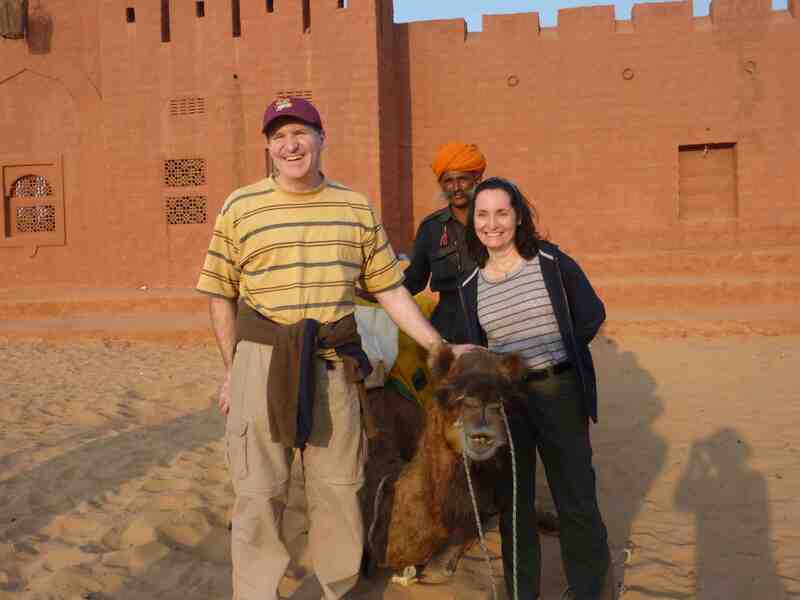 We spent New Years Eve at the camel camp and met the owner, Reggie, who had attended Kalamazoo College in the late 1980's and early 90's. We also met and befriended Ken Thompson and his wife. Ken is the Irish Ambassador to India. He is on his way to Turkey where he will be the ambassador to Turkey, Iran, Pakistan, Afghanistan, and, Azerbaijan. 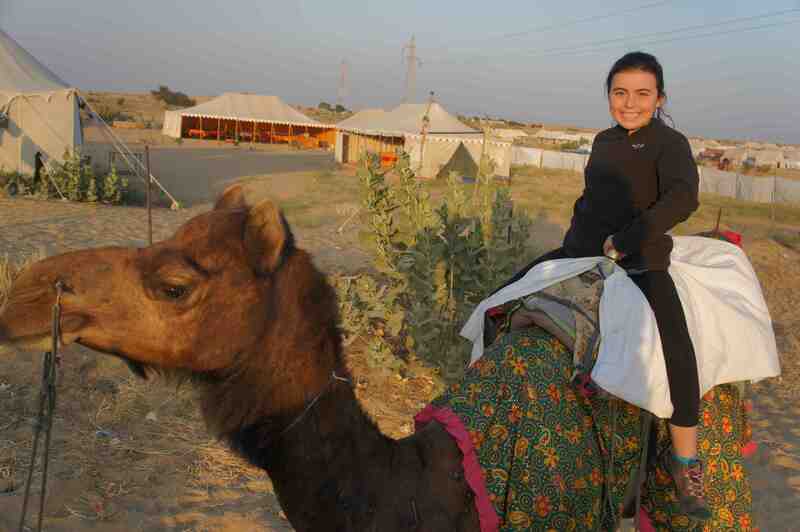 Greg removed a cataract from this camel's eye. Here you can see Greg and Laurie just after the procedure. 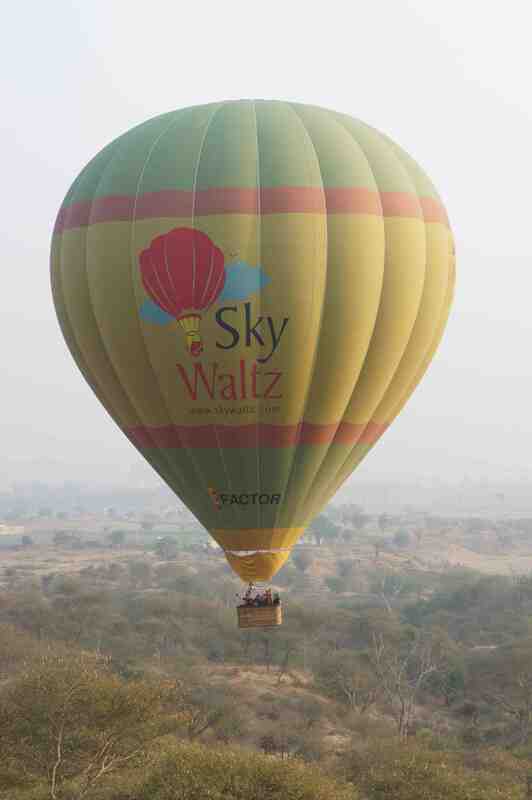 Jaisalmer was our next stop. The fort is incredible. 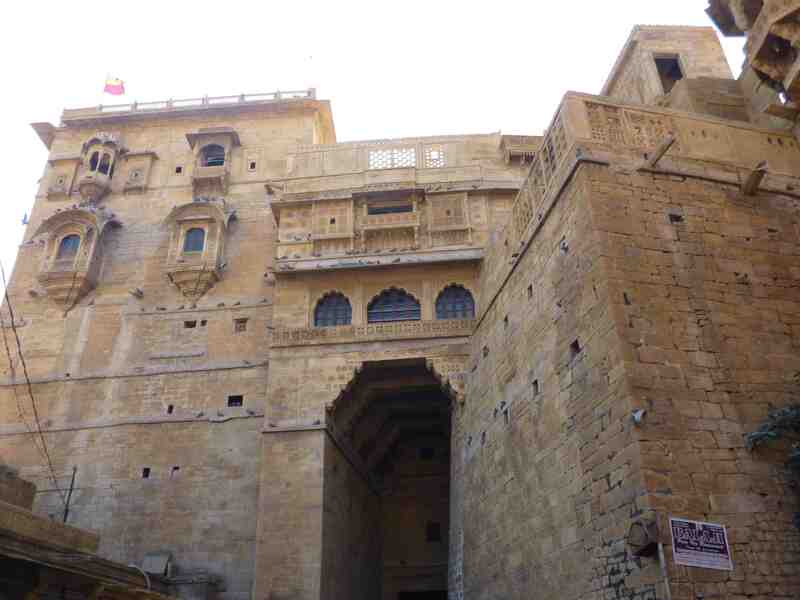 The for was built staring in 1156 AD by the Bhati Rajput. 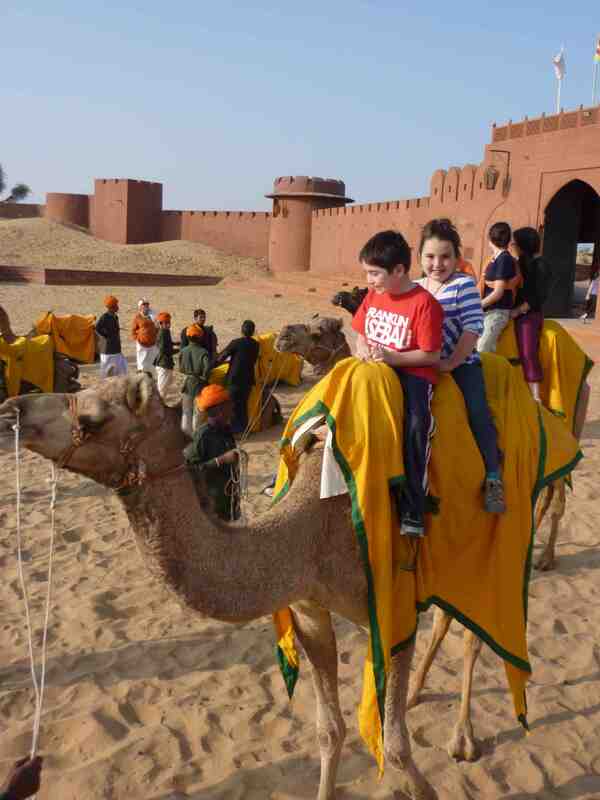 It is known as the Golden Fort because of the sand stone used in it's construction. 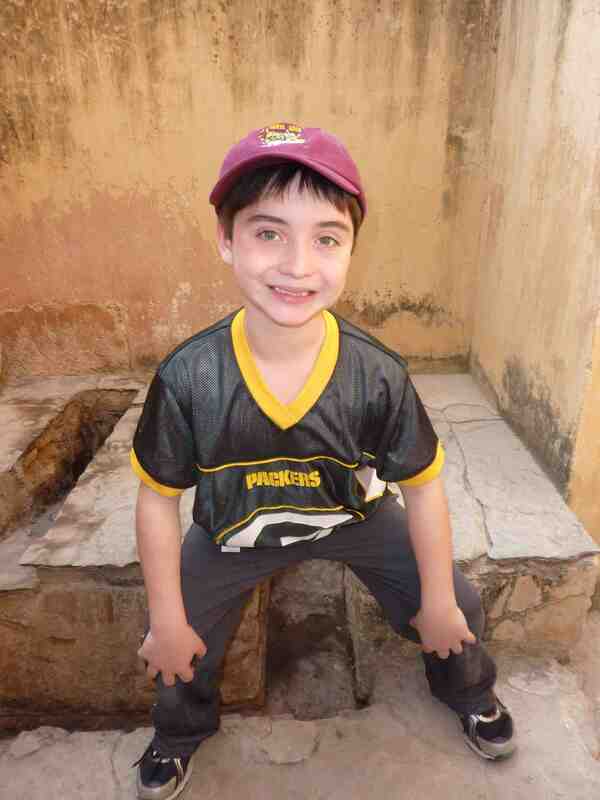 Thousands of people still live in the fort and we got the chance to go inside our guide's home and meet his family. His family has lived in the home for hundreds of years. 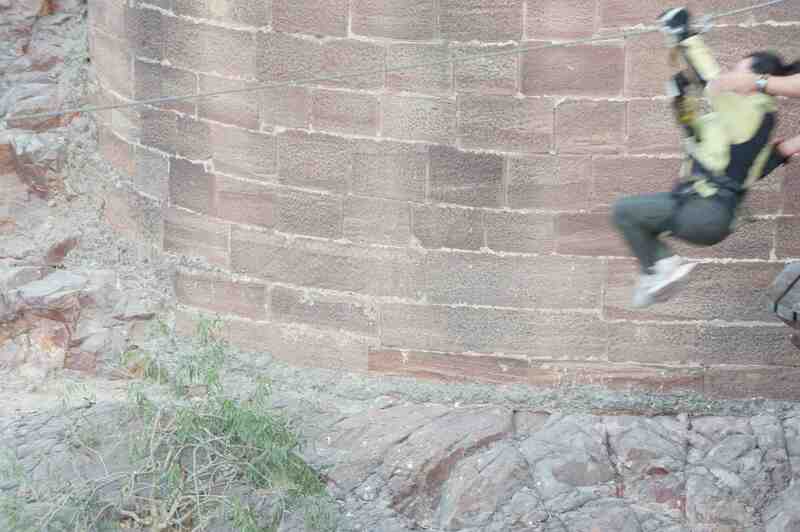 This incredible 10 year old supports her family by performing her tight rope act outside the Jaisalmer Fort. Apparently she has a sister who used to do the act until she fell and broke her leg? 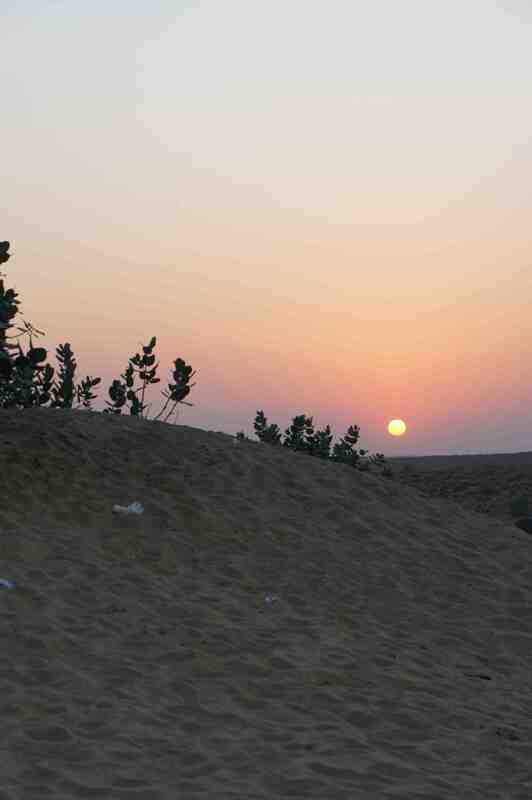 We went back to another camel camp in the Thar dessert. Eva is a master rider. 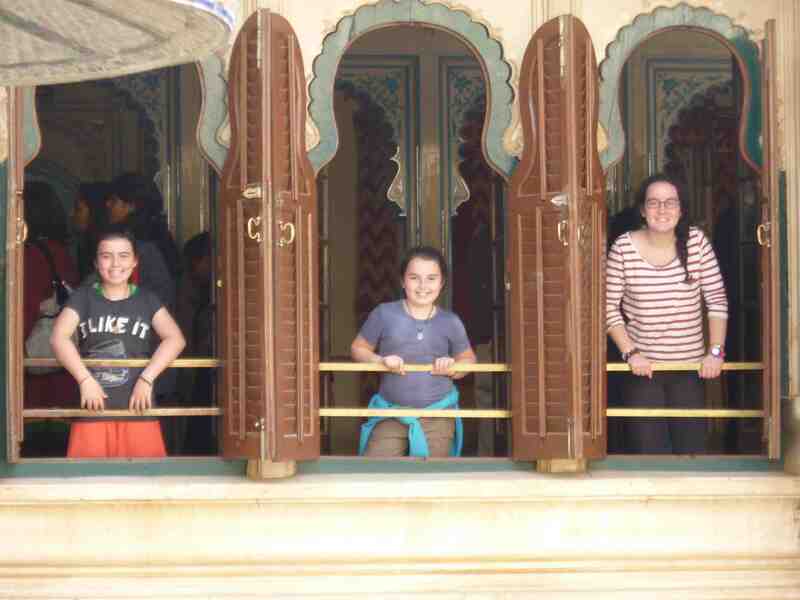 Next we stopped in Udaipur. 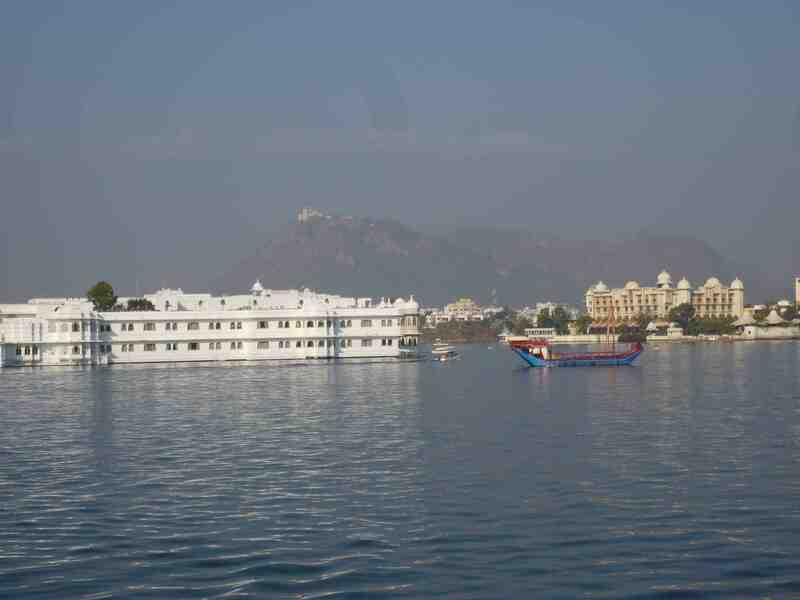 This is one of three lakes in Udaipur. You can see the summer palace in the background. 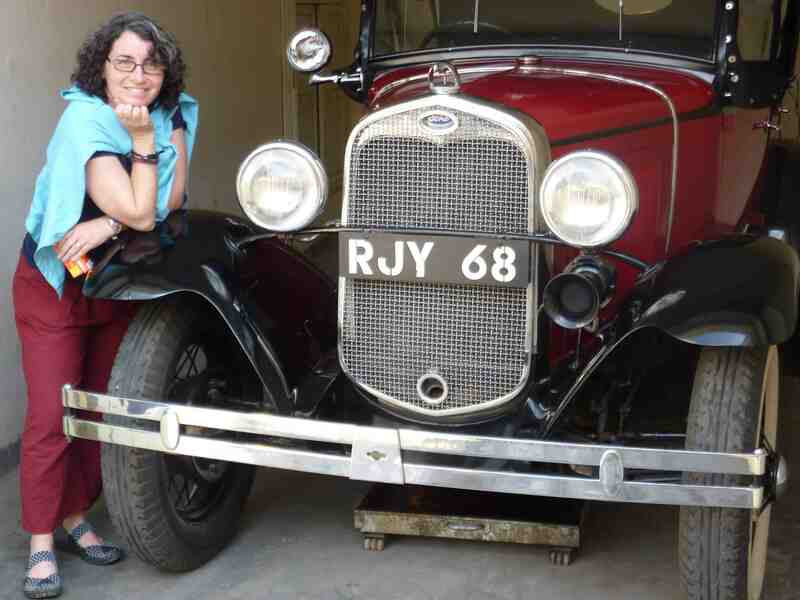 The Royal Family has a great car collection including this beautiful Model A Ford. They also had a bunch of Rolls Royces, Mercedes, old Cadillacs, and even a 1966 Rambler! 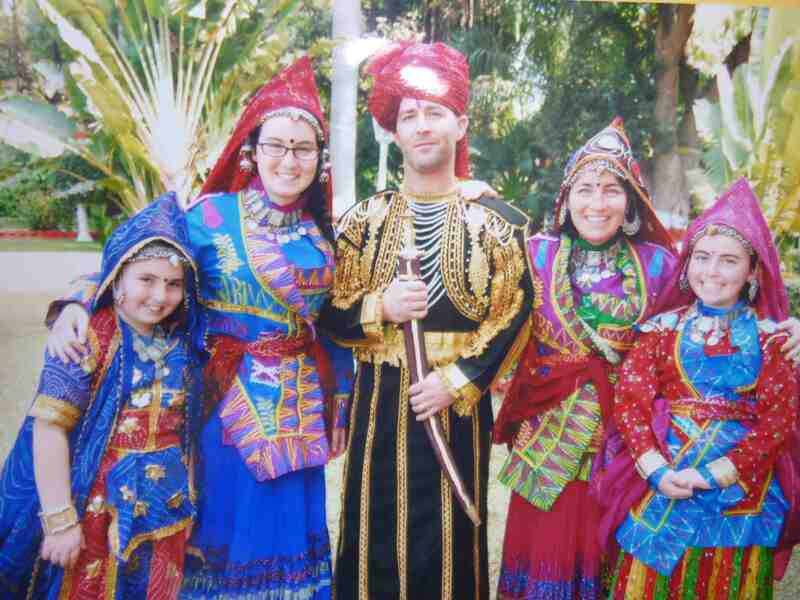 Here's what we may look like as Rajput Royals in 12th Century Udaipur, India. 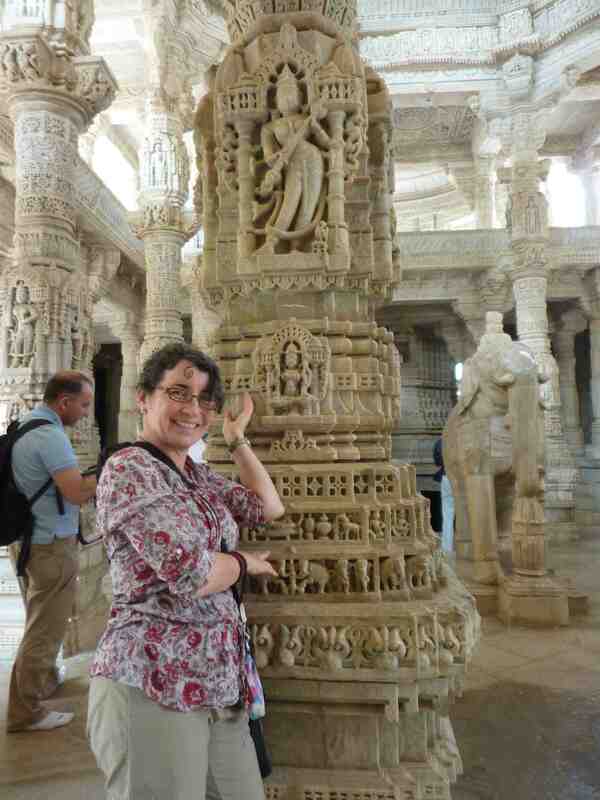 This is the Ranakpur Jain Temple which was built starting in 1437. It's incredibly detailed and has over 1444 marble columns, each with unique art. Amy and one of the unique columns. 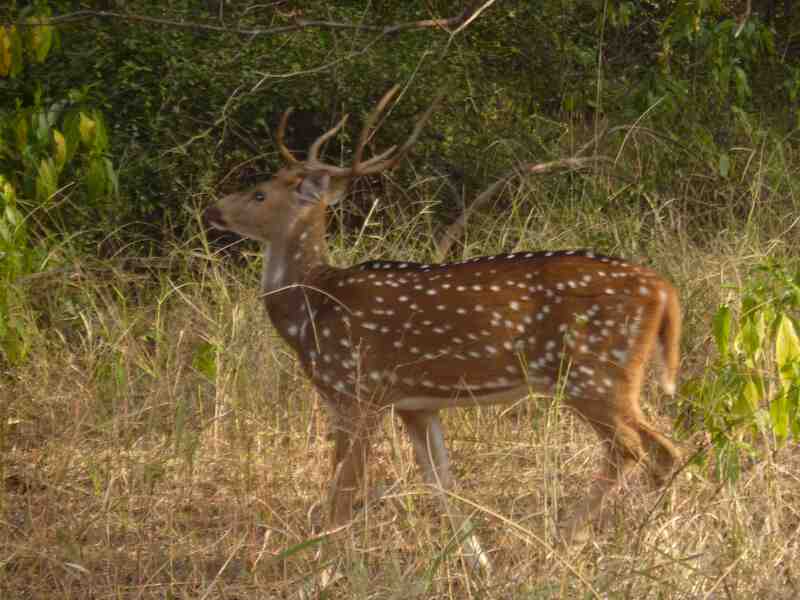 We went to Rhanthambore National Reserve where we saw some amazing wildlife including this spotted deer. 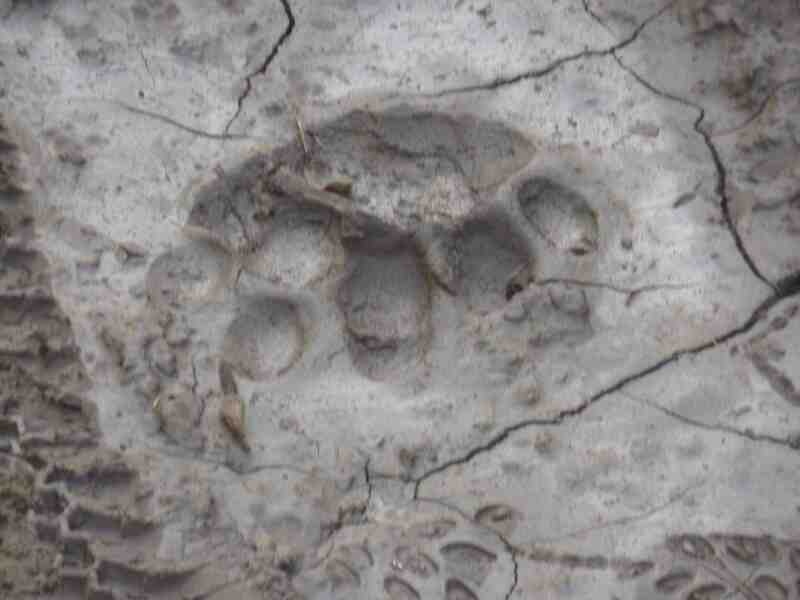 This is a male lion print that we saw our first day. The lion eluded us. 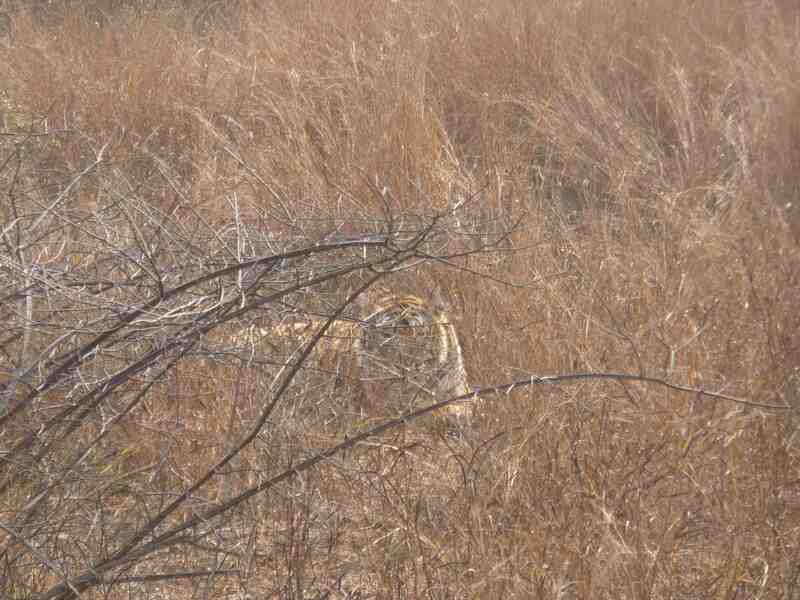 We finally saw the lion our last morning. It was sunning behind a tree. 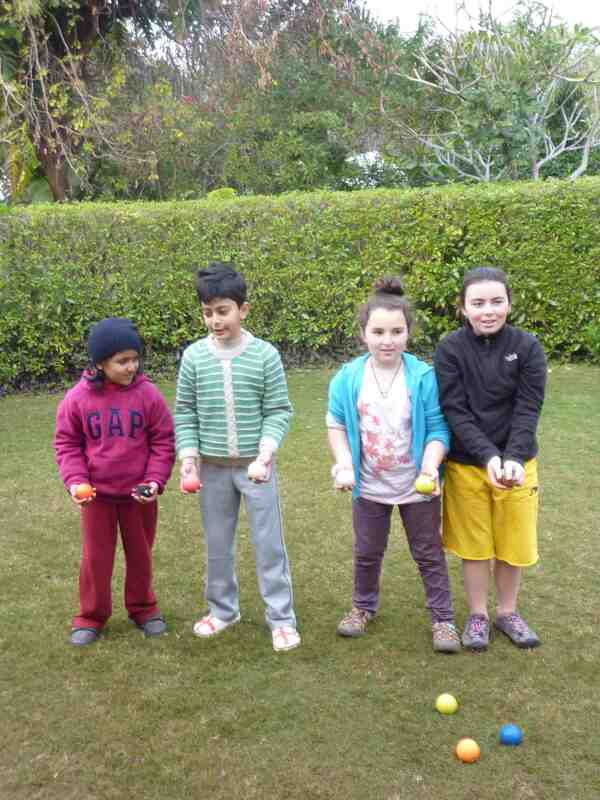 The kids made some friends from Delhi at Rhanthambore and we played some fun games. 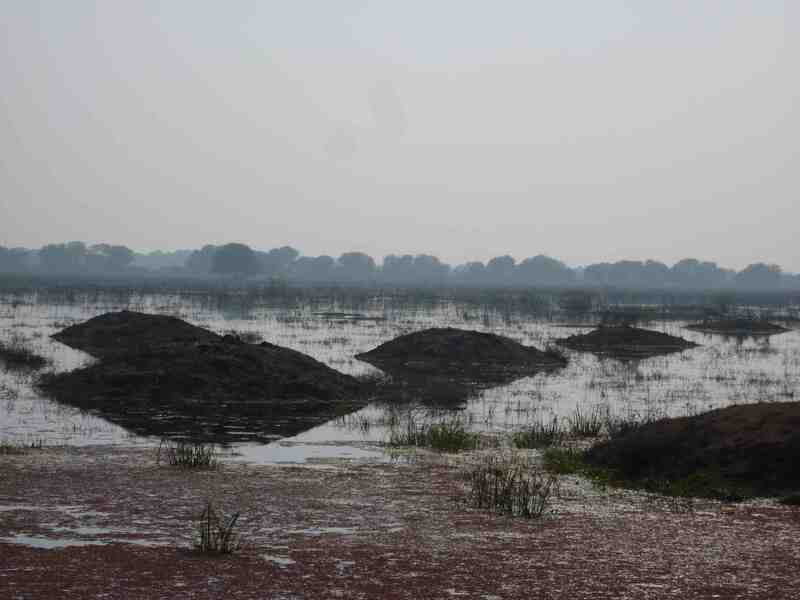 Our second to last stop was at Bharathpur, an amazing bird sanctuary. We stayed in the Barathpur Maharaja's Palace for two nights. 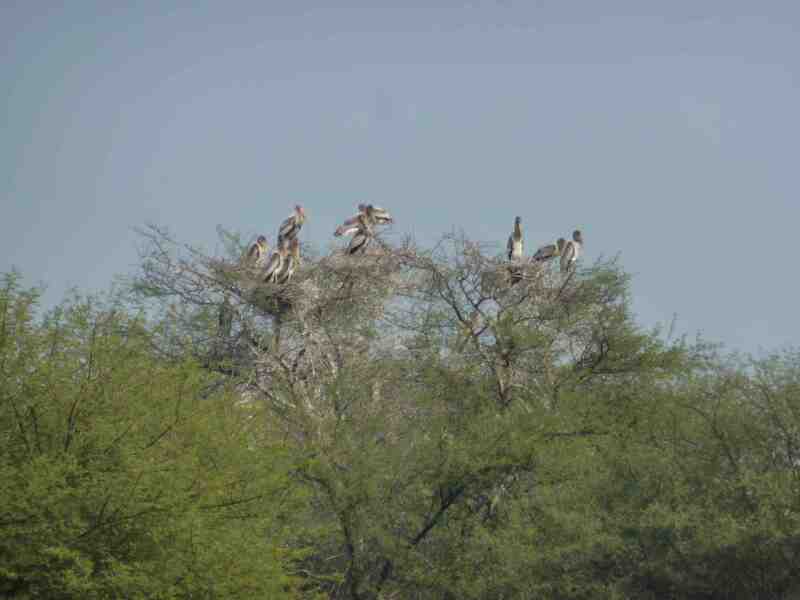 Storks at Bharatpur Bird Sanctuary. This was the former hunting grounds of the royal family. 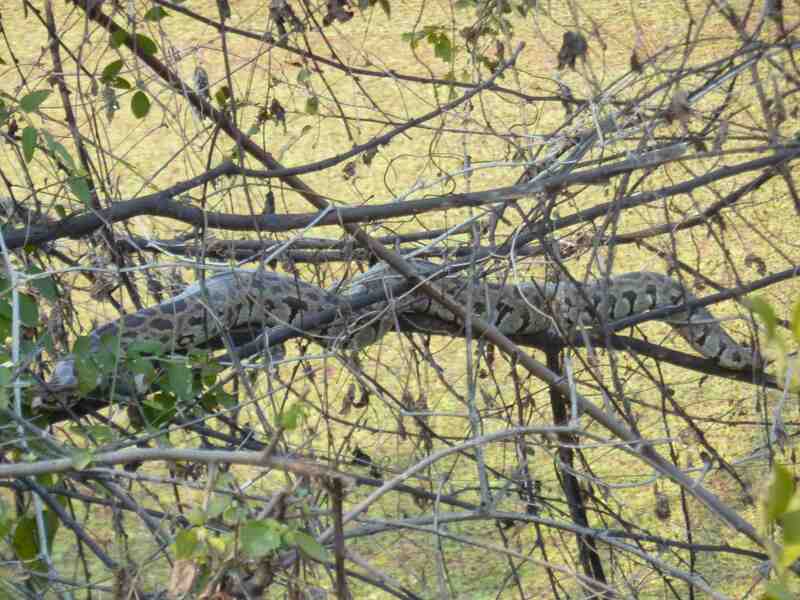 Our cycle rickshaw driver spotted this python in a tree. 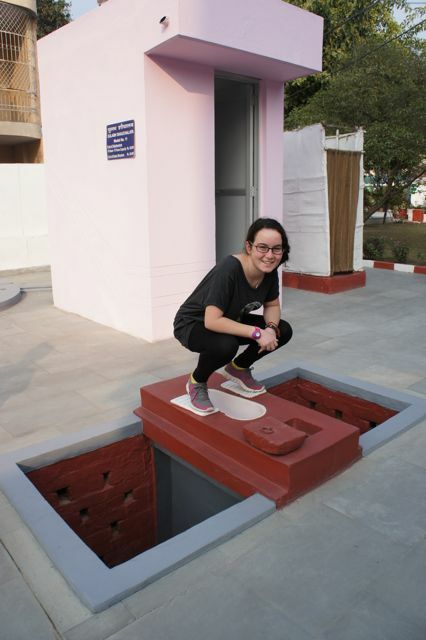 After a long day of touring Jaipur, we returned to our hotel and before we were going to head off to dinner, I decided to stop and use the bathroom. So I went and did my business, but when the time came to flush, I could not figure out how to work the toilet. There were no motion sensors or flush buttons on the toilet. The only thing I could see was this small metal bar with a button on the top hanging near to me. Without any other ideas on how to work the toilet, I pressed the button and with a yelp, jumped back as a jet stream of water shot out drenching me, and making it look like I just wet my pants. When I finally came out and explained my story to the rest of the group, they all burst out laughing at me. Aunt Amy informed me that it was obvious I had not been keeping up with their blogs or I would have known the device was used as an alternate way to clean yourself in the bathroom. I will not be making that mistake again in the future. The other day the bus stopped off the road for a short break. My dad, Ed, and David decided they needed to use the restroom, so they were gust going to go for a “walk” in the woods. But then, Amy and I realized we needed to used the restroom too. 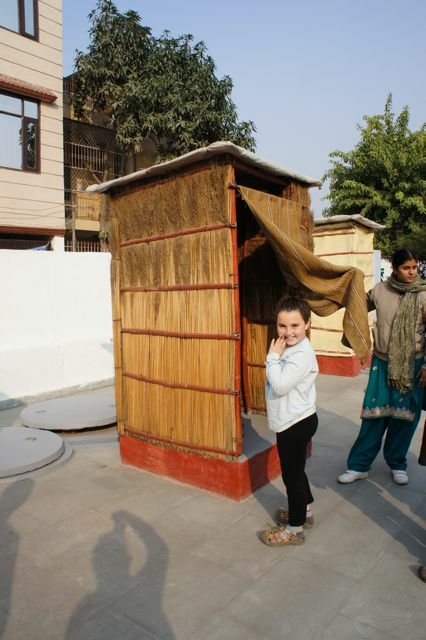 We had our guide, Vineet, ask an old lady where there was a toilet we could use. She motioned us to follow her. She did not speak any English. Any and I were nervous about what the condition of the restroom would be like. We knew it was not going to be good. This nice old lady then pointed to a circled, muddy area filled with papers and bottles on the ground. We realized our restroom had no toilets at all, also, no sink, no roof, no walls! We actually figured this was probably better than what we were expecting since we were in the fresh air and all. We squatted, did our business, and since we were in a junk yard, we just threw our papers on the ground. That was the benefit of the outdoor restroom. 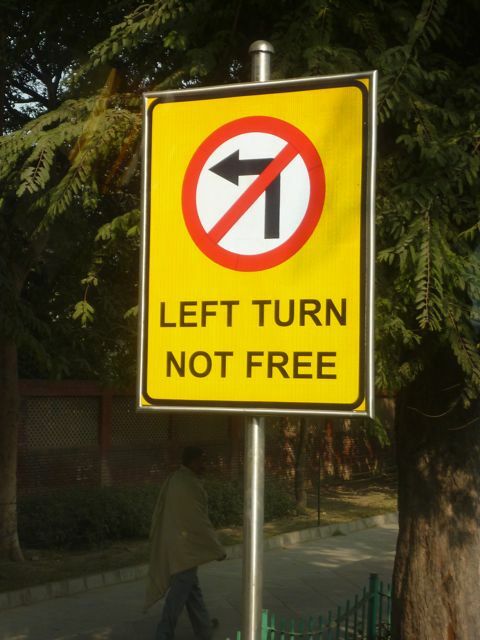 Welcome to India! We welcome our first guest bloggers. 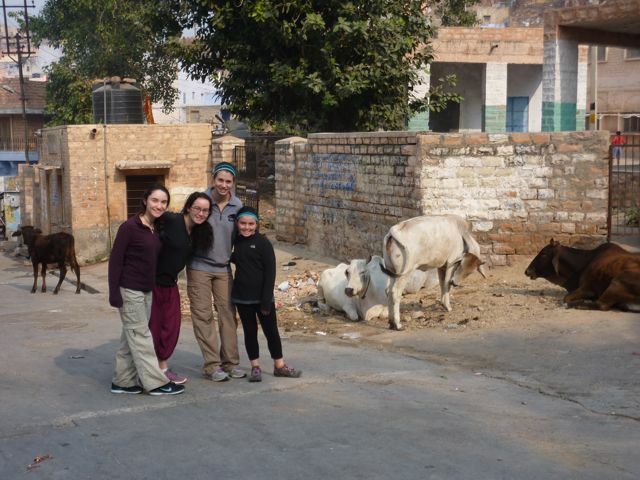 Jackie Katz and Rachel Hersch along with Maya composed this blog while riding across Rajasthan, India. 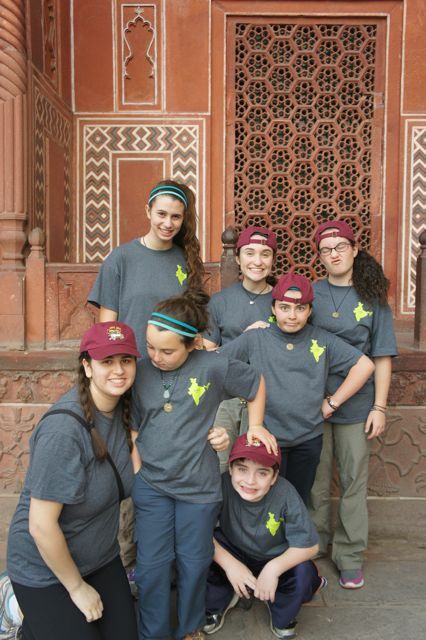 We had so much fun with the Katzes and Hersches and feel so honored that they would come all this way just to see us. 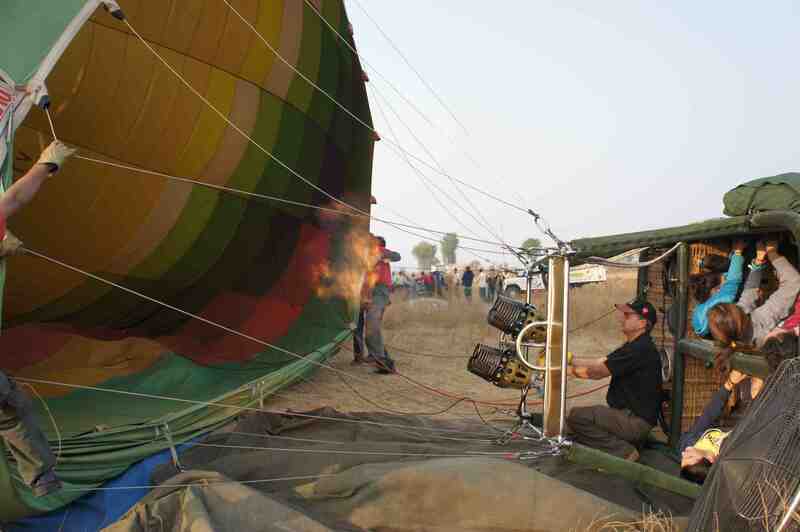 From our trip to India, we have compiled a list of tips and notes to remember for future travels. 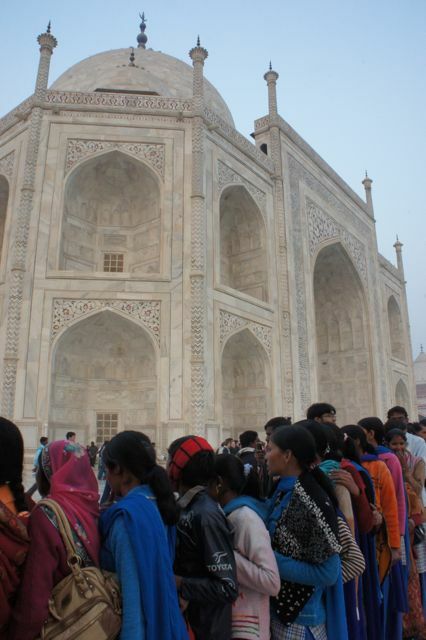 When visiting the Taj Mahal, be aware that it is a tomb and NOT a Hall of Tajmas, as Eva claimed. Also, it may be helpful to bring ear plugs because the guards constantly blow their whistles right in your ear. Or perhaps you may want to bring your own whistle and fight back. It’s up to you. 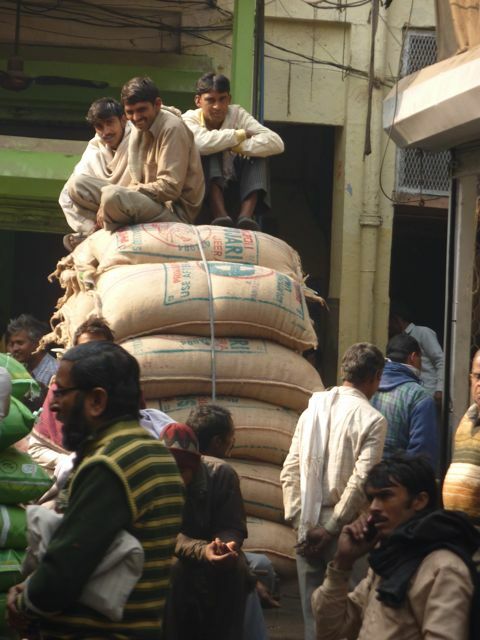 When visiting the Spice Market in Old Delhi, remember that the people carrying hundreds of pounds of spices on their back have right of way and they are not stopping for ANYONE! Some shortcuts through the market may be scary and in back alleys, but as long as you have a buddy system everything should be fine. Also, after visiting, if you have black boogers it is A okay. It’s just part of the experience. Traffic Laws mean nothing. Driving on either side of the road, honking consistently, and swerving in between cars is perfectly normal. REMEMBER TO ALWAYS WEAR A SEATBELT or Uncle Eddie will attack you with kisses. Don’t be afraid to try new foods. Some of the foods we tried were Chicken Masala, Garlic Naan, Aloogobhi, Chicken Tikka, Caju Purfi (silver coated cashew candy), samosa, Vegetable Korma, carrot pudding, Ice cream made from Camel milk, and Halwa from the Sikh Temple. Keep in mind- looks can be deceiving…but sometimes they’re notJ For the most part The Goldmans, everyone was very adventurous, except certain members of our group, who shall remain nameless. 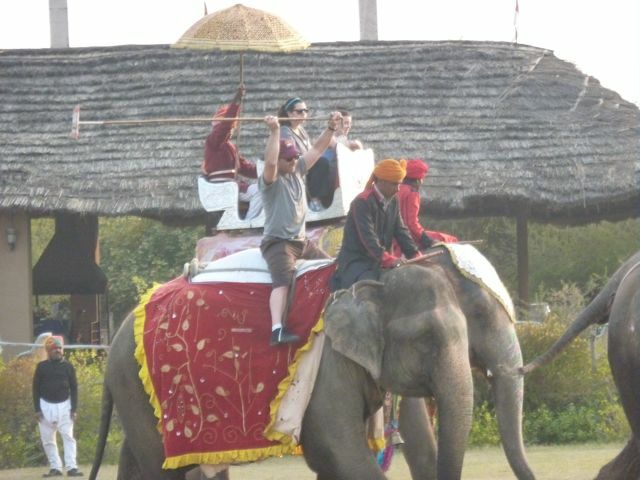 Elephant polo is a must when traveling to India. It’s a big no no for your elephant to step on the ball and pop it. However, it is completely legal for the elephant to pick up the ball with his trunk and walk through the goal. The elephants are VERY talented! We never lose each other. Cricket is so entertaining! 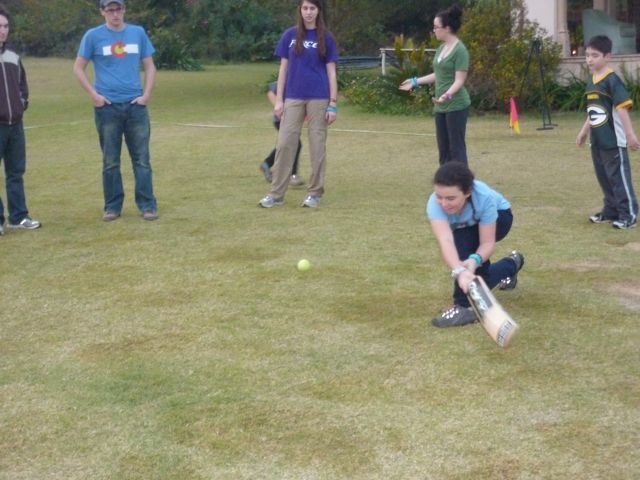 Our guide Vineet taught us how to play at the polo grounds, and although we aren’t quite as good as the professionals (yet), it was still fun to give it a try! 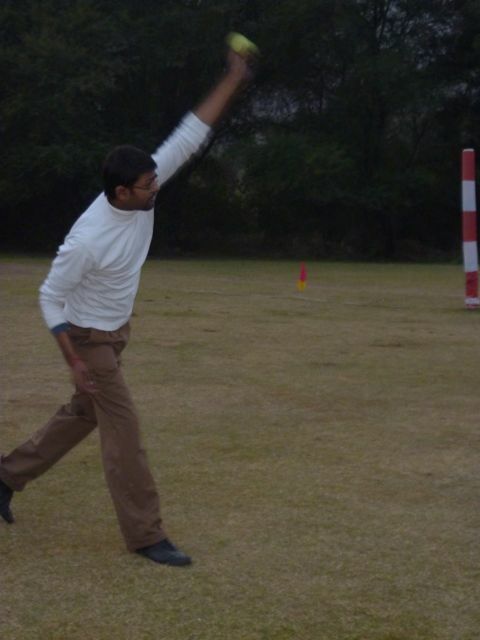 If anyone is interested, we are thinking about starting a metro-Detroit Cricket League. Call Jackie for more information. Sorry I have to do it...Holy Cow! 10. 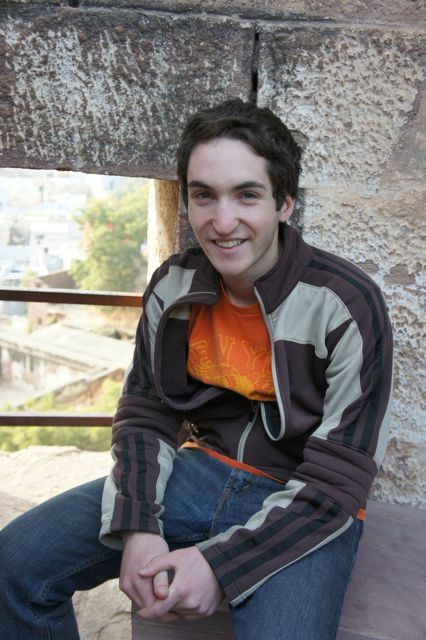 India is such a beautiful, exotic, and intriguing country filled with so much to do and so much to see. The people are so curious about us and always greet us with smiles. Seeing the poverty and their lifestyles truly makes us feel grateful for what we have.